It is with great pleasure that I share with you my pan de sal recipe. I worked very hard to get this one right. The first ones I made were like rocks and then after 10 more attempts I could shout-- SUCCESS! I was really obssessed in doing this correctly (read: I made it everyday until I got it just right), it didn't help that my standards are quite high. I want it to taste exactly like how they made it in the bakeshop in my hometown in the Philippines. My ultimate success was when I made it for my mother and she said that it is the best pan de sal she ever tried! Honestly, having the luxury of having pan de sal anytime I want here in Switzerland changed my life. 1. Dissolve yeast into 1/2 cup of warm water and 1 tbsp sugar. Wait until frothy. While proofing the yeast, mix & dissolve 1 cup dark brown sugar & salt into 1/2 cups warm water . Sift 6 cups of flour into large mixing bowl. 2. Fold 6 tablespoons of vegetable oil evenly into sifted flour add sugar & water and yeast & water mixtures to flour then add remaining 1 cup of water. Stir dough mixture with the hook of your mixer for about 5-10 minutes . The dough should be sticky. Take the dough out, clean the bowl then put oil in bowl. Place the dough back in the bowl then coat it with oil. Cover with saran wrap. Let rise until doubled in size probably about 1 hr in a warm place. Punch it down when it rises over the bowl. Let it rise one more time until double. 3. Knead the dough on a board then flatten it to about 3/4 inch thick. Reshape it into a ball then again place dough in bowl, cover and let rise again until doubles in size. 5. After dough has doubled in size place dough on a board then flatten dough to about 3/4 inch thick. 6. Spread dough across board. Cut dough into four columns & eight rows to yield 32 pandesal rolls . Shape each piece into a roll then roll it onto breadcrumbs and then place on a baking paper lined baking pan. 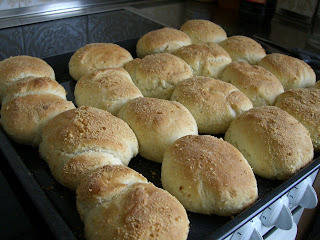 Arrange all 32 pandesal evenly on baking pan. 7. Let rise until doubled. 8. Place pan de sals into 350-degree fahrenheit oven for 10 to 15 minutes or until brown. You may be interested in trying out a different recipe which was handed down to me by my father. The procedures are basically the same except for the ingredients and the equipments, which Pan de Amerikana bread is unique for. Thanks for the info. Are you referring to the multiply page? The photo above is mine, I can prove it because it was taken on top of my oven in my previous apartment.